It's Wedding Season so Load Up on B12! Spring time is here and that means wedding season is amongst us. Actually, any time of the year is a good time for a wedding depending on the circumstances. I recently got married on March 26th and the day (or should I say entire week) was long and nerve-racking. You are probably wondering what do weddings have to do with B12? I’m getting to that and it ties in. Your energy is all over the place, mood is fluctuating, the focus is either on one thing or a million things, the memory is trying to take it all in, the nerves are anxious/excited, and overall you want to be 110% during the greatest day of your life! This is the part that a lot of people told my bride and I to breathe, which we did a lot of. It was an extremely busy week taking care of all the final details and getting everything together. Family and friends coming to town, girl time, guy time, rehearsal dinners, and then the big day which begins as soon as you get up in the morning and hit the ground running. Breakfast, shower, getting the groomsmen together, at the venue by noon, getting ready, an hour later waiting anxiously to get the first look at the bride, 3 hours of pictures, 45 minute ceremony, 3 hour party to celebrate, a 2 hour after party, and then finally alone time with the wife. An exciting joyous day that can take a lot out of you and I can see why the honeymoon is such a huge deal. It’s just one day, I get that, but you want to be in the moment, make the most of it, and enjoy it without being a groomzilla/bridezilla. Feeling good, focused, balanced, and energized, I can’t stress that enough. There are million things going on and you want something extra that will help during the whole week with balance and energy, B12. No I was not talking about alcohol but we did use it to mix in our drinks; wine and tequila to be exact. It’s water-soluble and made it taste good. We have the video of it which can be seen on our Instagram @Detroit_Vitamin. It wasn’t just a lot on the bride and I, also our parents and the wedding party. My wife, who can do a million things at once, found that taking B12 made the day seem smoother, and felt more grounded. B12 helped out major. During the wedding speeches, our matron of honor raved about it during her speech on how it saved the day! It shows that B12 is a powerhouse. So not all B12’s are created equal. Detroit Vitamin’s Deliver liquid B12 is different. It’s great tasting, vegan-friendly, no sugar, no crash, mixes well in any beverage, and quick absorption to help benefit with balance and energy to embrace the day. If you are getting married soon, congratulations! Deliver liquid B12 will help make those special moments feel a little more smoother. This entry was posted in DVC on April 25, 2017 by Nate. 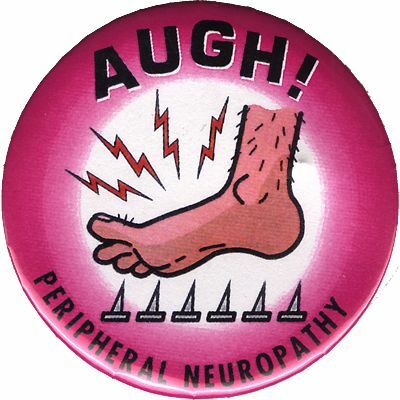 Can Deliver help with Peripheral Neuropathy? I recently received a customer review about Deliver liquid B12 and they said “This liquid vitamin B12 does indeed taste delicious. As for its efficacy, it seems to be helping to alleviate my peripheral neuropathy, leading me to believe that my condition may be due, as I had suspected, to inadequate intake of vitamin B12.” First off thank you for the review it means a lot and second, I am not a doctor, but B12 deficiency can cause lots of issues such as peripheral neuropathy. I am not an expert in peripheral neuropathy, and this is the first I have heard about it, but it seems common. According to the MAYO Clinic peripheral neuropathy is a weakness, numbness, and pain from nerve damage, usually in the hands and feet. Over 3 million people in the US have some form of peripheral neuropathy, it requires the medical diagnosis, and there are treatments, which can help, but no cure as of yet (though medications can reduce the pain). From my point of view, you never know how you are going to react to medications because everyone is different. What causes peripheral neuropathy? According to Medical News Today, high blood sugar levels from poorly controlled diabetes can cause nerve damage. B12 deficiencies are also tied to nerve damage hence peripheral neuropathy. This is where you go see a doctor if you’re concerned about symptoms. The good news is that I don’t think peripheral neuropathy is all doom and gloom if you effectively implement healthy lifestyle changes to your diet, exercise, and sleep. You can manage and deal with it to enjoy the day and life. The one thing I took out of this review (besides Deliver tasting delicious) was the inadequate intake of vitamin B12. Deliver liquid B12 has helped alleviate the symptoms of this man’s peripheral neuropathy, which is great. Deliver liquid B12 is not a cure but it helps. If you have high blood sugar levels or diabetic, there is no sugar in Deliver just healthy aloe juice (I can go on about it in another blog post another time). So if you or someone who is dealing with peripheral neuropathy, Deliver liquid B12 may help you deal with and alleviate the symptoms. We recently received a review for Deliver with the title “Great flavor but they could do a better job with …” and then the person adding “Great flavor but they could do a better job with the syringe/dropper, the quality is low and it doesn't hold all the liquid.” It was surprising to hear and a little disappointing because Detroit Vitamin focuses on quality not just on the best tasting liquid B12 Methylcobalamin, but the whole package including the dropper. The reviews so far for Deliver have been great and this was a bit surprising even for the dropper itself. There was no complaints about the dropper. At the end of the day you can’t please everybody but we do focus on a great tasting B12 that does the job with a great message/story to tell. This is feedback, and there’s 2 things you can do with feedback. Reject it and let the ego get in the way or learn from it and do it better next time. Droppers are important because they capture the right amount of liquid to help get the most benefit. Too much or too little depends on personal preference. Deliver is water soluble so little or much can only help and do no harm. It’s personal preference or what your doctor recommends. Again if you use Deliver correctly, it will help deliver you results. So what is Detroit Vitamin going to do about the droppers? We immediately contacted our co-packer who helps make Deliver and let them know what was going on. They told us they were having issues with their supplier and are currently working with a new supplier. As of right now, when you’re reading this, the issue has been corrected, and Deliver has brand new droppers that WILL NOT fail on you or your MONEY BACK, GUARANTEED. It is Detroit Vitamin Company’s responsibility and policy to make sure that customers are 100% satisfied. For this reason Deliver has new and improved droppers that will not leak and are good quality. By now the issue is corrected. Could Marmite help prevent Dementia and Alzheimers? What’s the first thing when you hear the word Marmite? What is it, Vegemite? Close, it’s a spread exactly like Vegemite with a different name, made from a yeast extract a by-product of beer brewing. It’s spreadable and it goes on toast. It is a dark brown, sticky paste, with a very distinctive, powerful flavor, which is extremely salty and it is very popular in the U.K. It’s an acquired taste. To most American’s this probably isn’t their cup of tea, they’ll probably stick to peanut butter. But in all seriousness could Marmite help prevent Dementia and Alzheimer's? According to a study by York University in Ontario Canada, there is a high concentration of vitamin B12 in Marmite which is found to help increase brain chemicals such as GABA which protects memory and well-being from neurological disorders such as dementia and alzheimer's. Participants in the study ate a spoonful of the yeast spread everyday for a month. After 30 days a 30 percent reduction in the brain’s response to visual stimuli, measured by recording electrical activity with electroencephalography (EEG). This is great news for people that are deficient in B12, vegans, or over the age of 45 that are concerned with memory issues. Only thing is, as I mentioned earlier Marmite is an acquired taste, it has a high concentration of yeast, some people are allergic or sensitive to yeast, and Marmite is not popular in the United States which is not available in every grocery store so it is not easy to get. There must be a better way?!?! There is, a tastier smoother way, Deliver liquid B12. Unlike sacrificing your taste buds to salty sticky yeast, Deliver provides the recommended daily dose of easy digestible vegan friendly Methylcobalamin B12. 1 to 2 full droppers under the tongue will do the job. Deliver might not be good on toast but it mixes great in smoothies, juice, water or any beverage of your choosing. Just like the Marmite experiment, try Deliver every day for a month and after 30 days you don’t feel a difference in your energy, focus, mood, and memory return it for your money back! Please note the results may vary. I am not a doctor and this post is for educational purposes and are not intended to replace the advice of your doctor. If you're interested, yet concerned if you have a severe medical condition or health concern and wondering if Deliver liquid B12 is right for you please see your physician. This entry was posted in DVC on April 22, 2017 by Nate.